It's Cyber Monday in July at Groupon! Today only save up to 80% Off select Doorbuster deals! 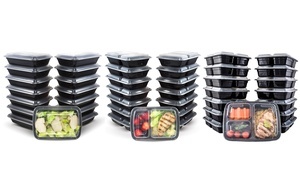 Check out this Meal Prep Bento Lunch Boxes with Lids (30-Piece Set) now just $10.99 (Reg. $24.99)! Dimensions: (H)8" x (W)5" x (L)10"
Check out all the offers here. Sale ends 7/17 and while supplies last.